Student Union Election Held on 31/08/2018. Results were declared on 11/9/2018. IQAC cell organized an interactive session for girl students and female staff on “Women Health and Hygiene” by Dr. Monika Khandelwal , Sr. Consultant Gynecologist and Laproscopic surgeon, GBH American Hospital, Udaipur on 12 Jan 2018. She spoke on role of nutrition in maintaining hormonal changes in girls as well as in women. 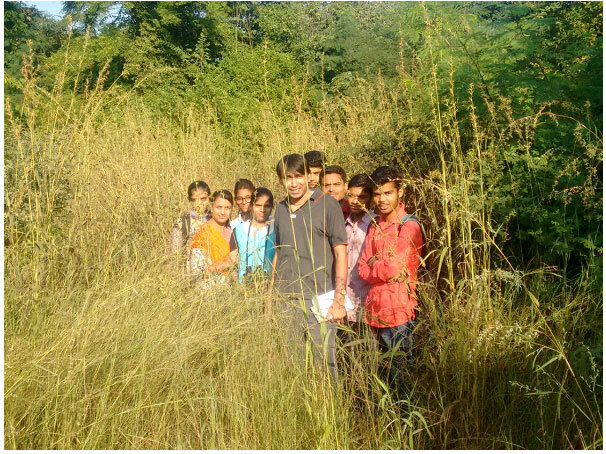 Department of Botany had organized a field trip for students of Biology to Vidya Bhawan Krishi Vigyan Kendra on 12/1/2018. Dr. A.S Jodha, Director, VBKVK took students to plant nursery and farm, explained various techniques of farming like Aquaformics, hydrophormics, soilless farming etc. He also showed various techniques of plant breeding like layering, budding, grafting, etc. VBRI became champion in intercollegiate Archery held at 9-10 Dec 2017. Ram Kishore Kurdia was selected as Best Player for World University Trial in archery. Three students of VBRI were selected for National Level Tournament. Placement cell has organized a workshop on 6 Dec 2017 on “Interview Skills and Resume Drafting”for all streams of students. Khushali Sharma , student of BCA II year was selected for West Zone Women’s Volleyball Tournament. suraj Sahu was selected as Best Player in the Intercollegiate Chess Tournament. He also represented MLSU at National Level. Intercollegiate Women Volleyball tournament was organized by VBRI on 26- 27 sep 2017. Govt. 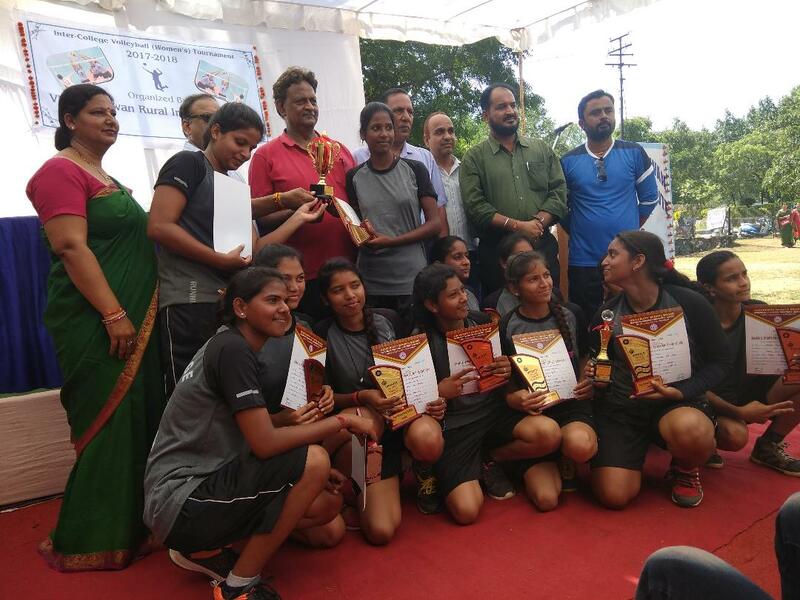 MG College Udaipur defeatet the B.N.P.G Girls college, Rajsamand in the Finals by 3-0. Department of zoology organized an expert lecture on “Myths related to Snakes” on 25 Sep 2017. Mr. Padam Singh of Snake rescue team and Mr. Gunjan Pancholi explained about dangerous and non dangerous species of snakes. Fresher party for Students of M.Sc Chemistry was organized on 22 Sep 2017.Ms. 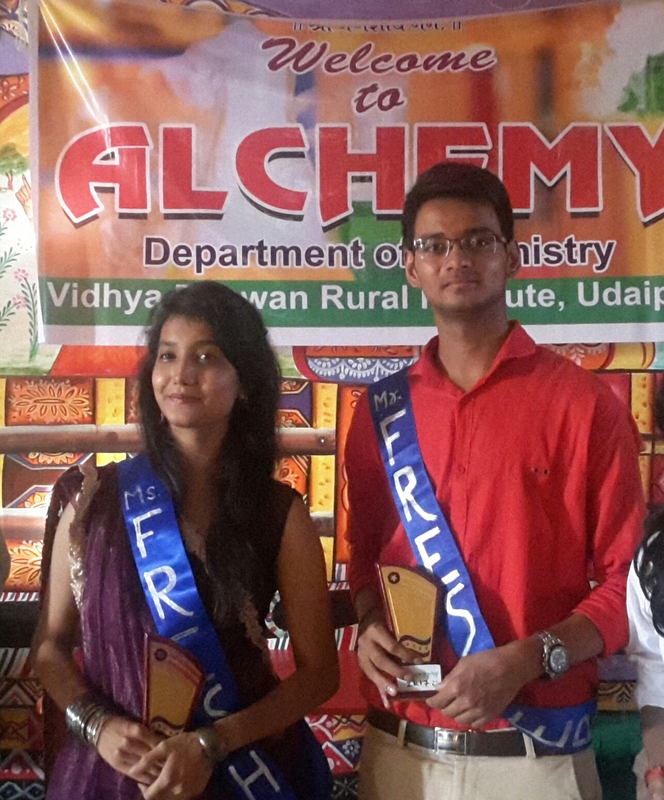 Falguni and Mr. Devvrat were selected as Miss Fresher and Mr Fresher. One day seminar on GST was organized by faculty of commerce and management on 19 Aug 2017 Mr. Anish Nayar and Mr. Deepak Kumawat delivered their views on importance and effect of GST. Annual function “Malhar- 2017” was organized on 28, 30 &31 Jan 2017. First day Mehandi , Rangoli and Painting comptetion were held. On second day Solo song, Group Song, solo dance and group Dance were held. On Last day Mr. Deepesh Chaturvedi was declared Mr. VBRI and Ms. Khushali Sharma was declared Miss. VBRI. IQAC (Internal Quality Assurance Cell) of VBRI have organized one day seminar on 27/01/2017 on “Quality Improvements in Educational Institutions”. Prof. Kanika Sharma and Prof. Karunesh Saxena of Mohan Lal Sukhadia University, Udaipur were the keynote speakers of the event. Prof. Kanika delivered her lecture on “Detailed Analysis of Quality Criteria and Marketing Pattern of NAAC” and Prof. Karunesh highlighted upon “Role of IQAC in Achieving NAAC Accreditation”. This event was organized as the IQAC annual activity for teaching staff of the college and total 35 staff members have participated in it. Sports are the integral part of our college. Sports week was organized from 16 Dec to 22 Dec 2017. 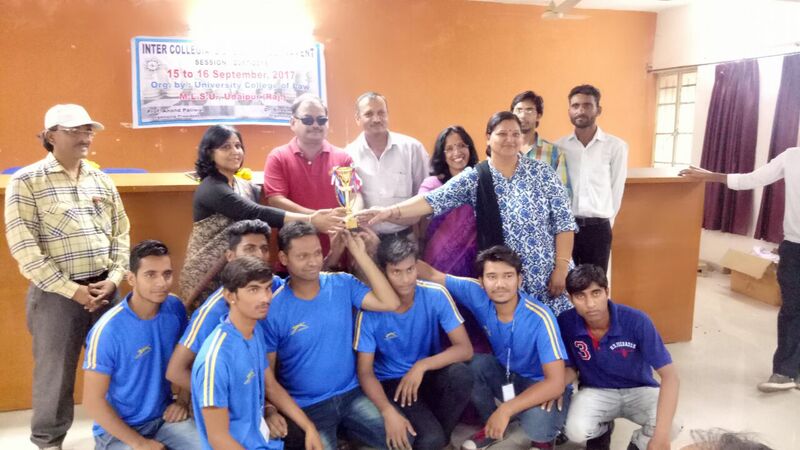 Various interclass tournaments like Cricket, volleyball and Kho –Kho were held. 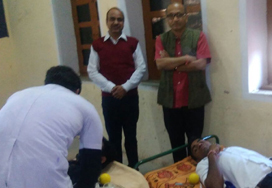 The National Service Scheme (NSS) and HDFC Bank , in association with Saral Blood Bank, Udaipur have organized Blood donation camp in the college premises on 7 December 2016. About 40 students and staff members have volunteered in this camp for donating blood. Fresher party for Students of M.Sc Chemistry was organized on 9 Nov 2016.Ms. Heena Joshi And Ankit Vaishnav were selected as Miss Fresher and Mr Fresher. Mr. Hitesh Kumar Treivedi, student of VBRI college, of Second year science (Maths) secured 94.37% in MLSU exams 2016. He is the Topper of University. The department of chemistry has introduced newsletter Aurum. Continuing with the proud tradition of the Chemistry department, senior students and newcomers of the PG level, mingled with each other at the fresher’s welcome party held on 12th sept 2015 in the college seminar hall. It was a fun filled event at which the freshers got an opportunity not only to showcase their talents and but also to interact with the seniors. A Hindi week was celebrated from 14 Sep 2015 to 21 Sep 2015. Various activities like essay competition, quiz, poem recitation and debate were conducted during this week. 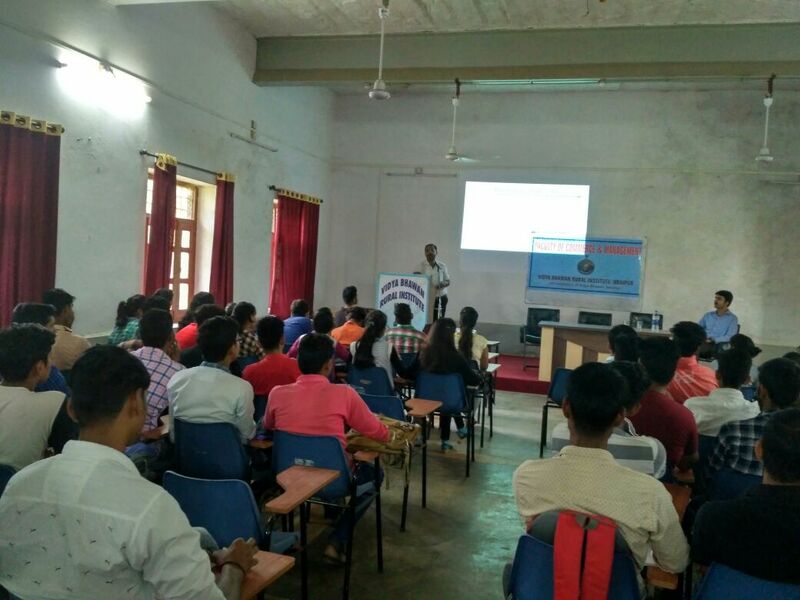 Personality development and communication Skills workshop was conducted by the department in collaboration with Titanium and Mewar computers on 15th Oct 2015. It was aimed to acquaint the students with finer aspects of communicational skills and be focused in life. It was an effort to motivate and encourage them to be conscientious students, to be diligent citizens. Department Of Computer Science had organised a Poster Competition 10th Dec 2015 in which students made posters on Computer and IT theme. All Institutions of Vidya Bhawan Society celebrated the 66th Republic Day at Vidya Bhawan Rural Institute. Shri Riaz Tehsin, President, Vidya Bhawan Society hoisted the national flag and the national anthem was sung. He read the Aims and Objects mentioned in the Constitution of Vidya Bhawan and explained their relation with the Preamble of the Constitution of India. The students and the staff pledged themselves to upholding the honour, integrity and diversity of India. Dr. T.P. Sharma, Director, VBRI welcomed the staff and students. Prizes were given to outstanding students the fields of education, sports etc. Vivid cultural programmes were presented by students of schools and colleges of Vidya Bhawan. Shri Anil Mehta, Principal, Vidya Bhawan Polytechnic, thanked the guests. The students of M.Sc. Final Year went on an industrial visit to Bhilwara. They visited BSL, Bhilwara on 13 January 2015. The students learnt about various processes- from fiber to fabric making and dyeing of woolens and polyesters. The industrial visit was conducted under the supervision of HoD and staff of the Department of Chemistry, VBRI. The VBRI Inter-class Cricket Tournament was held from 22 to 24 December 2014 at the College grounds. The final match was played between B.A. II-Year and B.A. I-Year . Batting first, B.A. I-Year made 118 runs in 25 over s. B.A. II-Year successfully chased the target in 16.3 over and won the match. National Assessment and Accreditation council (NAAC) awarded 'B' Grade to Vidya Bhawan Rural Institute (VBRI). NAAC team had visited VBRI from 27 to 29 November 2014 for assessment and evaluation of quality in higher education. NAAC Peer Team Members were Chairperson Prof. A. Joseph Dorairaj of Gandhigram Rural Institute (Deemed University) Gandhigram, District Dindigul in Tamilnadu, Co-ordinator Prof. R.M. Ranganath, former Registrar of Bangalore University and Member Dr. Bibekananda Sarmah, Principal, JDSG College, Golaghat in Assam. National Assessment and Accreditation council (NAAC) team visited Vidya Bhawan Rural Institute (VBRI) from 27 to 29 November 2014 for assessment and evaluation of quality in higher education. NAAC Peer Team Members were Chairperson Prof. A. Joseph Dorairaj of Gandhigram Rural Institute (Deemed University) Gandhigram, District Dindigul in Tamilnadu, Co-ordinator Prof. R.M. Ranganath, former Registrar of Bangalore University and Member Dr. Bibekananda Sarmah, Principal, JDSG College, Golaghat in Assam. On the first day, a presentation was given by the Director of VBRI Dr. T.P. Sharma. NAAC team visited various departments and had meeting with the stakeholders including parents, students and alumni. On the second day, the team visited the remaining departments, Sports section, Library, Rover Unit, NSS, Accounts department and Student's Section. On the third day, Exit Meeting was held in which NAAC Peer Team Members, President of Vidya Bhawan Society Shri Riaz Tehsin, Organizing Secretary of VBS Shri S.P. Gaur, Director of VBRI Dr. T.P. Sharma, NAAC Coordinator Dr. Saba Khan, HoDs and entire staff were present. The assessment report was handed over to the Director Dr. T.P. Sharma. Please click to read NAAC Self Study Report- Cycle II. Old Students Association of Vidya Bhawan Rural Institute (VBRI) was formed on 20th July 2013. Please see Alumni Association and Downloads to know more about the Association and to get registered as member. 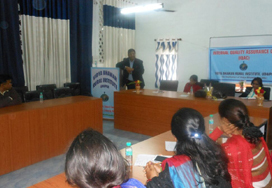 An Entrepreneurship Awareness Camp was organized by the Department of Chemistry from 6 to 8 November 2014 at the College. On the first day, Shri Anil Mehta, Principal of VBPC, gave the keynote address which covered the general concept, introduction and historical background of entrepreneurship; and Indian values and present scenario of entrepreneurship. Shri J.P. Gupta, District Industries Officer from D.I.C., shared ideas on identification of business opportunities for entrepreneurs, product selection, technology assistance and technical collaboration. Shri Riaz Tehsin, President of Vidya Bhawan Society and Dr. T.P. Sharma, Director of VBRI also addressed the session. On the second day, Sh. Harikant Sanchiyar, Economic Investigator of District Industries Center, talked in detail about the establishment of Small Scale Industrial (SSI) unit. He informed about the government procedures, rules and regulations, location and techno-commercial aspects of a SSI unit. Shri G.C. Jain, Deputy Manager of R.F.C., spoke on financial assistance from government agencies, banks, financial institutions, SFCs etc. Students were taken for an industrial visit to Vikas Controls and Switchgears at Udhyog Vihar in Sukher. On the third day, Dr. Heena Khan, Asst. Prof. at J.R.N. University, Dr. Rakshit Ameta, Asst. Prof. at Pacific College of Basic and Applied Sciences, and Shri Dharmendra Dave, Managing Director of Rajasthan Abrasives Pvt. Ltd. spoke on areas of business and entrepreneurship. Total 115 students participated in the camp, which was sponsored by DST-NIMAT. Please click on the link below for the Report. A study of 'Conventional and Microwave Assisted Solvent Free Synthesis of Some Benzothiazole Derivatives and Their Comparison' was conducted by Vidya Bhawan Rural Institute (VBRI). The UGC sponsored Minor Research Project was done during April 2013 to October 2014. The Principal Investigator was Dr. Manish Kumar Rawal and Co-Investigator was Dr. Saba Khan, both from Department of Chemistry, VBRI. The study was published in Iran JoC. Please click on the link below to read the report. Deeksha Sanskar of Rovers was held on 2 October 2014 at the College campus. Dr. Shriram Arya administered the oath to 17 Rovers. It was followed by prayer meeting and service for cleanliness to mark the Swach Bharat Abhiyan. An inter-class general knowledge competition on Sanskrit language was organised by the Department of Sanskrit on 16 September 2014. Total 35 students participated in the competition under the guidance of HoD Dr. Archana Jain. Shri Bhanwar Lal Dangi, Ms. Savita Kumari and Shri Keshu Lal Gameti secured the first three positions respectively. Hindi-week was celebrated by the Department of Hindi from 9 to 15 September 2014. The events began with an extempore-competition on 9 September; 10 students spoke on issues of female feticide, dowry, corruption etc. An essay-competition on "Future of Hindi in the present scenario" was held on 10 September. Forty students took part in the Hindi grammar competition on 11 September. A debate was held on the topic "Speaking in Hindi mars our reputation" on 13 September. The week-long events concluded on 15 September. Litterateur Dr. Lakshi Lal Vairagi urged to look at Hindi beyond the limitations of competition and prestige. Dr. Saraswati Joshi, HoD and convener of the Hindi-week, said that the events were successful in bringing awareness about the language and providing a platform for developing language skills through various medium. A two-day camp of the Rover Unit of VBRI was held at Seva Mandir's training center at Kaya village on 20-21 August 2014 . Twenty-four Rovers participated in the camp under the guidance of Dr. Shriram Arya. Various activities were held, which included community service, hiking, cultural programmes etc. The Department of Political Science of VBRI organized a National Conference on "Interrelation of Indian Democracy and Peoples Movements" on 31 January & 1 February, 2014. The two-days conference was sponsored by the UGC. Prof. Naresh Dadheech, Director, Institute of Development Studies, Jaipur gave the keynote address. He brought to fore various aspects of identities, social movements and their meaningful role in the Indian politics especially in filling the gap between the desires of the unattended people and the agenda and role of the national political parties. Prof. Sanjay Lodha, Dean PG, MLSU, emphasized that the present era has been described as 'The Age of Democracy'. The modern Indian polity is an outcome of a long national liberation movement led by the Indian National Congress. After Independence, the country has been witness to a number of interest and identity based movements. He also mentioned the civil society movements in Rajasthan. Chief Guest Shri T.C. Damor, Vice Chancellor of Rajiv Gandhi Tribal University, said that the key issue in any political system is the access of the citizenry to power and resources; and the dignity and equal space in the transformations. Presiding over the session Prof. Arun Chaturvedi said that ensuring human rights, freedom, equality, inclusive sustainable development pose a pressing demand for urgent public initiative. Dr. T.P. Sharma, Director of VBRI, gave the vote of thanks. Advocate Prahlad Rai Vyas, social activist from Bhilwara, gave a perspective of people's movement, labour organizations of communist parties and the drawbacks of Indian politics. Twenty papers were presented on aspects of people's movements. Prof. Arun Chaturvedi presided over the session. Ms. Kavita Shrivastava observed that Rajasthan has had campaigns and social unrest but no people's movement. The processes should be democratic incorporating constitutional values and principles. Dr. Manoj Lodha elucidated upon the vital role of mass media in shaping up people's movements. Dr. Naresh Bhargava said that the concept of social movements is under debate world over. The movements based on identities are related to the cultural aspects and have a wide canvas. Twelve papers were presented in this session. Dr. Veddan Sudhir noted that the people's movements in pre-independent India were inclusive of all caste, relegion and gender while most of the present movements are based on caste and regionalism. Prof. Meena Gaur chaired the session; 13 papers were presented. Prof. Sanjay Lodha said that lack of respect and denial of access to even basic amenities leads to interest based movements. Anil Mehta, while sharing his experience of fighting for the cause of lakes, presented the wide gap between policy-making and its implementation. In most cases, advocacy for a social cause is termed as anti-administration movement. Prof. S.L. Meena of Jodhpur University presided over the session. Twenty-two papers were presented. Dr. Naresh Bhargava spoke on the nature and effect of movements based on religion, language, dialects, gender etc. Dr. Neeraj Gupta gave historical perspective of these movements. Dr. Veddan Sudhir presided over the session; 20 papers were presented. Chief Speaker Prof. Chandrakala Padia, Vice Chancellor of Maharaja Ganga Singh University, Bikaner, highlighted India's diversity, different movements and their positive role. She said that social movements have played a vital role in emancipation of the marginalised sections of the society and strengthening democracy. She also threw light on the fundamentalist movements, their dimensions and linkages. Prof. Divya Prabha Nagar and Prof. M.P. Sharma also addressed the session. Dr. Archana Jain, HoD, Department of Arts of VBRI, presented the report on the two days' deliberations. Dr. Manoj Rajguru, Organizing Secretary of the Conference, gave vote of thanks. The 65th Republic Day was celebrated by all institutions of Vidya Bhawan Society (VBS) at VBRI on 26 January 2014. Shri Riaz Tehsin, President of VBS, hoisted the national flag, which was followed by the national anthem. Shri Tehsin reiterated faith in the aims and objects of Vidya Bhawan, which were formed during the freedom struggle and which confirm to the spirit of the Preamble of the Constitution. He presented certificates and prizes to the meritorious students of the last academic session and sports achievers. 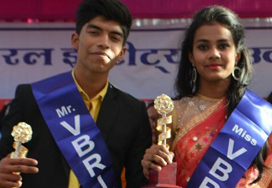 'Jhankar-2014', the Annual Function of VBRI, was held from 16 to 18 January 2014 at the College. Rangoli and Mehandi competitions were held on the first day. On the second day, solo-song and dance, Group song and dance and fancy dress competitions were held. A critique of burning issues was evident in the events. On the last day, Mr. Jayesh Pandya was chosen 'Mr. VBRI' and Ms. Kiran Kunwar 'Miss VBRI'. The Department of Commerce of VBRI organised a UGC sponsored National Conference on 'Innovative Trends in Youth Empowerment' on 10-11 January 2014. Mr. Siraj Delhve, Vice President (HR) of Secure Meters, gave the key-note address in which he emphasised the need for encouragement, education and opportunity to empower youth. The role of the youth should be envisioned as part of the solution. The young generation should be nurtured to think locally and act globally. Chief Guest Prof. B.P. Bhatnagar, Ex Vice-Chancellor, JRNRVU, Udaipur said that Indian youth is creative, innovative and enthusiastic. Their energy should be utilised in a constructive manner. Prof. Farida Shah, HoD Economics, MLS University, Udaipur, said that in recent times the perception of empowerment of youth has been limited to employment. Youth empowerment should mean recognising and valuing their abilities. This would bring a change in their attitude, which would, in turn, bring a positive transformation in the society. Growth of the nation would require proper channelization of the energy of the young generation. Shri Riaz Tehsin, President of Vidya Bhawan Society, presided over the inaugural session. Various aspects of the theme of the conference were discussed in four technical sessions. Teachnical Session-I was on 'Education and Youth Empowerment'. Dr. Kailash Brijwasi was the key-note speaker, while Prof. P.K. Jain chaired the session. Papers were presented on soft skills, present education system, quality management education, health education, role of ICT, innovation and re-engineering. Teachnical Session-II	was on 'Entrepreneurship and Youth Empowerment'. Dr. Bharati Dave was the key-note speaker while Prof. Farida Shah chaired the session. Papers related to the role of industry, HR outsourcing, role of motivation and youth empowerment, youth and brand development and economic reforms and youth were presented. Technical Session-III was on 'Rural Youth Empowerment'. Dr. Nilesh Suchak was the key-note speaker while Prof. D.S. Chundawat chaired the session. Papers were presented on the role of NGOs in youth empowerment, rural entrepreneurship, youth and women empowerment, and on sports, CSR, social changes and technical skill gaps with relation to youth. Technical Session-IV was on 'Problems and Prospects of 21st Century'. Dr. K.K. Dave was the key-note speaker and Shri Anil Mehta chaired the session. Papers were presented on generation gaps, and spirituality, democracy and unemployment in relation to the young generation. In the concluding session Dr. P.K. Dashora, Member of RPSC, Ajmer said that government should make serious efforts to strengthen the young population of India by generating more employment opportunities for skilled and educated youth. Young men and women should have entrepreneurial spirit. They should act on their creative and innovative ideas, so that they can contribute towards the betterment of the society. Role models should emerge from the young generation. Prof. B.L.Chaudhary, Ex. Vice-Chancellor, MLS University, Udaipur said that quality education is a must for an empowered youth. Education should expand their horizon of thinking so that they can initiate and innovate in solving the problems and developing new ideas. Dr. T.P. Sharma, Director of VBRI and Dr. Anushree Sharma also addressed the session. Total 114 participants were registered, 50 papers were submitted and 42 papers were presented. The inference drawn from the conference was that youth empowerment is a continuous and dynamic process, and has a ripple effect in the society. Youth should realize and utilize their energy and innovative powers in a constructive way for betterment of self and society. The Department of Zoology of VBRI organised a UGC sponsored National Conference on “Climate Change and Environment” on 23-24 December 2013. The Conference has inaugurated by Chief Guest Prof. I.V. Trivedi, Vice Chancellor of MLS University. On the first day, keynote address was delivered by Prof. N.S. Rathore, Vice Chancellor of SKN Agriculture University, Jobner. Expert lectures were delivered by Prof. B.L. Choudhary, former Vice Chancellor of MLS University, Shri K.K. Garg, CCF, Department of Forest, Udaipur, Shri R.P. Sharma, Secretary, UIT Udaipur and Dr. Satish Sharma, ACF, Department of Forest, Udaipur. The lectures covered various aspects of climate change and effects on the environment. On the second day, expert lectures were delivered by Prof. Maheep Bhatnagar, Dean of College of Science, MLSU, Udaipur, Dr. L.K. Dadhich Retd. Principal, Prof. S.K. Katewa, Emeritus Scientist, MLS University and Dr. R.K. Garg, Retd. Lecturer. Delegates from other states presented papers and posters. In all 53 posters were presented. Dr. Daksha Sharma's poster was adjudged as the First Best Poster and Ms. Monika Sen's poster as the Second Best Poster. According to Dr. Sushma Jain, Organizing Secretary of the Conference, total 300 delegates participated from all over India. The National Service Scheme unit of VBRI organised a seven days camp at village Chikalwas near Udaipur on 25-31 December 2013. The volunteers participated in shramdaan (labour service), took out social awareness rally and organised public awareness programmes under the guidance of Dr. Archana Jain, Mr. Pooran Singh and other faculty members. Expert lectures were held on bio-diversity and environment, Panchayati Raj etc. Ms. Soni Kumari Paswan and Shri Devaram received 'Best Volunteer Prize' for girls and boys respectively. Inter-class Cricket Tournament was held at VBRI in December 2013. In the closely contested final, BBM team won the Tournament by defeating B.Sc.-III Year by 3 wickets. Shri Riaz Tehsin, President, Vidya Bhawan Society, administered Oath of Office to the newly elected Student's Union of VBRI on 12th September 2013. Elections for the Student's Union 2013-14 were held on 24th August 2013 in a cordial atmosphere. Shri Vikas Dangi was elected for the post of President while Shri Dheeraj Shrimali was elected General Secretary. Student-volunteers of the First and Second units of National Service Scheme (NSS) participated in the one day camp on 8th August 2013. The volunteers planted 200 saplings in the College campus. The event was organised in collaboration with Vidya Bhawan Krishi Vigyana Kendra. One day workshop on aspect of book review was organized by Department of Political Science on 5th August 2013. Prof. Arun Chaturvedi chaired the workshop and gave valuable tips. Participants wrote reviews and made their presentations. 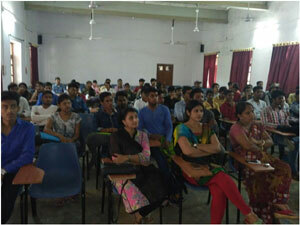 A lecture on ‘Biodiversity and Conservation’ was delivered by Dr. R.K. Garg on 29th July 2013. Ten days ‘Sanskrit Sambhashan Shivira’ was organized from 10th to 19th October, 2012.